It’s cold rainy winter days in Dharamshala, your stomach is rumbling and screaming food! Cooking, a simple mundane activity otherwise seems like a herculean task now! To stand hours in kitchen in shivering cold and prepare food one needs have dogged determination. So what do you feed yourself ? Well, on top of that if you have barely a few ingredients in hand it only makes your face go red and curse yourself for even trying! But hey, necessity is the mother of invention, ain’t it? Too lazy to go out and buy anything I had these easy-to-follow warm comforting recipes customized/invented for my aching winter soul that kept me satiated for atleast two three days! Influenced by south east Asian and Tibetan noodle soups, these recipes are more like base for rich heavy noodle meals. 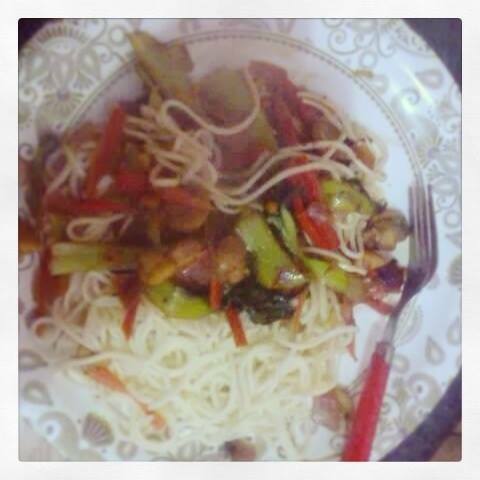 Recipe 1: Stir fry veggies with boiled rice/Noodles of choice. 2. Ginger, 3 cloves garlic and 1 green chili. 3. Handful of fresh coriander leaves, one lemon, 2 teaspoon Honey/ sugar, red pepper flakes. 4. Soy Sauce/ tomato chili sauce/ schezwan sauce. 2. Heat oil in a deep pan, add finely chopped ginger garlic and chopped green chili, red pepper flakes and stir fry for a few seconds. 3. Add the vegetables, saute and toss! Cover the pan and cook until the veggies are tender on simmer gas. 4. When the vegetables are cooked al-dente, add salt, soy sauce, honey, coriander leaves and lemon. 5. 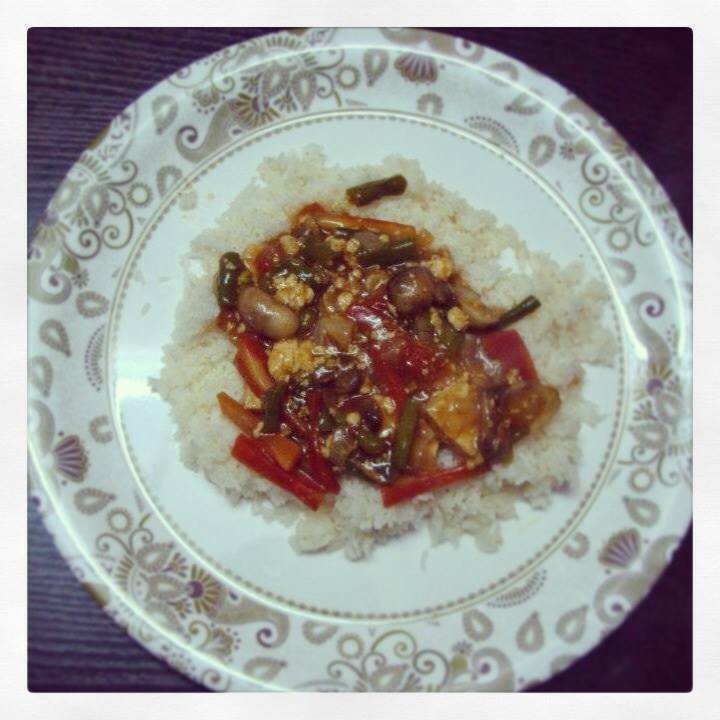 Mix well and serve hot with boiled/steamed rice/ noodles of choice. 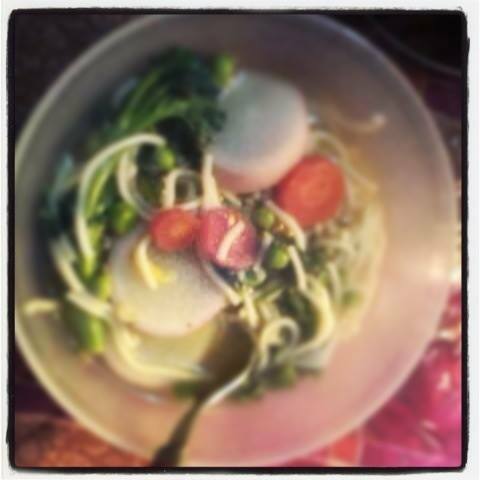 Recipe 3: Hearty vegetable noodle soup! To the recipe 1 instead of tossing the veggies, I added water and had vegetables boil in it. When they are tender and still crunchy add noodles in the end and garnish with coriander leaves! With same ingredients we have quick food ready and no, they do not taste the same! You can always alter the flavors with different types of seasoning and garnishes! To add a zing one can use lemon or vinegar. Posted in Uncategorized. Tagged Bok Choy, Dharamshala Diaries, Food, Food in Hills, Himachal Pradesh, McleodGanj, Noodle Soup, Stir Fry Veggies, Winter Mountain Food. Next: Next post: Lemony Days!